Motivated by hate, many Internet atheists act like mentally impaired schoolchildren by attacking Christians. These bigots have done it to many people: me, Christian filmmakers and campus groups, books on Amazon, recording artists — and the Creation Museum. Not here, Nellie. You'll have to click here to read the rest of "Atheists Use Unethical Tactics to Attack Creation Museum". Buona sera. Time for some thunder from Stormbringer! Yours truly performs a public service on occasion. Well, on many occasions. Anyway, I like to show scams and spam. Although most of my readers are perceptive, I still want to warn the general populace. Those that do not need to be warned can share my contempt for this loser. Scammers deserve to be exposed, capice? Nicky forwarded this e-mail that he received. We both wonder, how low can people go? Due to security reasons I have attached a business proposal that will yield huge benefits. Read the attached instruction and reply. I am Captain Robert Bingham with the United Nations troop that was stationed in Iraq, on war against terrorism. Based on the United States legislative and executive decision for withdrawing troops from ,I have been deployed to Afghanistan. I want to inform you that I and my Colleagues in the same Division sometime in April 18,2010, discovered a pair of cement sheds filled with metal boxes.Inside each box was $4 million in cash -- $750 million American dollars in all. I have in my possession the sum of $32 Million United State Dollars which is my share from the money. I have successfully disguised/packed and deposited this money as Military sensitive material with a security firm in United Kingdom. I am proposing introducing you to the security firm as the bonafide beneficiary to the consignment for further investment. Instead of allowing these terrorists to get the money and spend it on purchasing arms from Russia, it is better channeled to saving the world which i propose supporting charity homes, being a military man,I am not allowed to parade such amount and as a trained Military expert, I am always security conscious. If you accept, I will prepare power of attorney that will help you claim the consignment of funds from the security company's vault. Please if you are interested in this transaction I will give to you the complete details you need for us to carry out this transaction successfully. I decided to find someone that is real and not imaginary and that is why I went to a secured website where I can be sure that the person is real. Where we are now we can only communicate through our military communication a facility which is secured so nobody can monitor our emails, then I can explain in details to you. I will only reach you through email, because our calls might be monitored, I just have to be sure whom I am dealing with. If you are interested please send me your Full Name,Physical Address and Personal mobile number, so I can call you for further inquiries when I am out of our military network. I am writing from a fresh email account so if you are not interested do not reply to this email and please delete this message, if no response after some days I will then search for someone else. I am doing this on blind trust, you should understand and you should know that as a trained military expert I will always play safe in case you are the bad type, but I pray you are not. $32 million US is a lot of money which is the dream of anyone. I wait for your contact details so we can go on. In less than 7 days the money should be in your custody and I will come over for my fair share when I am finally withdrawn from here.I will give to you 30% of the sum and 70% is for me. I hope I am being fair on this deal. 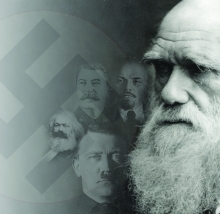 "Darwin's book is very important and serves me as a basis in natural science for the class struggle in history." Evolutionary propaganda is a masterpiece. The Nazis and Soviet Union would approve. First, the populace worships "science". Next, leftist governments push God out of schools and public places. Follow that with equating operational science (which can be observed, tested, measured, falsified, repeated and so forth) with historical, speculative science and pretend evolution is "science". Join that stuff with anti-God propaganda and liberal theology (not to mention human laziness), and "scientific" Darwinian concepts run rampant. Taking Darwin's popularization of evolution (it was not original with him, you know) as "science", people wanted to apply it as a social principle as well. With horrible results. Evil, in the socialist worldview, is the oppression of the working class by the bourgeoisie. Having been enlightened by Marx regarding the ‘true history of life’, men and women could now take control of that history. They could accelerate ‘nature’ as it sped towards its goal of a world revolution that would banish such ‘evil’ and produce a socialist utopia. Hitler, I discovered, shared a similar worldview, as outlined in his book Mein Kampf (literally ‘my struggle’). He believed that people, like animals and plants, were engaged in a constant struggle for survival. The climax of history would be the survival of the fittest race—which he believed to be the ‘Aryan race’, as embodied in the German people. Hitler and Stalin both applied their ‘scientific’ logic with a ruthless, overwhelming determination. So did Mao Zedong in China, where countless millions also perished in the name of a utopian Marxist dream. And they not only convinced themselves, but millions of others—people just like you and me—that they were right to do so. Read the entirety of "Darwin’s impact—the bloodstained legacy of evolution" here. We believe in Darwin, the father all-sovereign, explainer of all things visible and invisible, and in one Thomas Henry Huxley, the bulldog of Darwin, begotten from the substance of Darwin. We believe in his son, Julian Huxley, of one substance with his Father. Who, for our enlightenment, were made flesh and became men, who suffered grievously at the hands of petty academics, were denied tenure and publication at State schools, but rose to preeminence at superior universities and ascended into endowed chairs and chancellorships without end. By their convictions and firmly held beliefs may we and all our works be judged. For we are the chimps of his lab and the apes of his zoo. Amen.